Handmade with Love by Sarah: Happy Anniversary! I needed to make an anniversary card for Ryan as today is our 17th wedding anniversary. 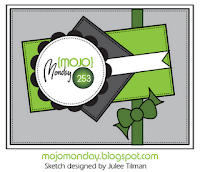 I decided to use this week's Mojo Monday sketch as the circle panel would be perfect for the owl stamps I wanted to use, and I could squeeze a sentiment onto the little pennant. 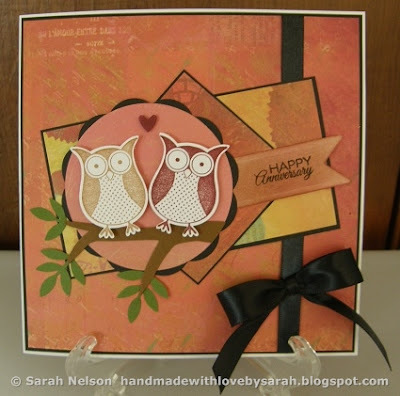 I stamped the owls in two different colors that coordinated with my papers, and then punched them out with the coordinating punch. I used foam tape to pop up the owls and the heart. I cut a little branch freehand and then added some leaf punches for leaves at the end of the branches. The pennant paper was sponged with the same two inks I used for the owls, and I'm really happy with how well it matches the dps! Hubby's comment was "Very cute." Stamps: Owls from SU! "Punch Bunch" SAB set, sentiment from Verve "Love Story"
Papers: White, black, dps from K&Co. Brenda Walton "Mira"